Since 2008 with the publication of Fight On #1, the Old School Renaissance has had its own fanzines. The advantage of the Old School Renaissance is that the various Retroclones draw from the same source and thus one Dungeons & Dragons-style RPG is compatible with another. This means that the contents of one fanzine will compatible with the Retroclone that you already run and play even if not specifically written for it. Labyrinth Lord and Lamentations of the Flame Princess Weird Fantasy Roleplay have proved to be popular choices to base fanzines around, as has Swords & Wizardry. 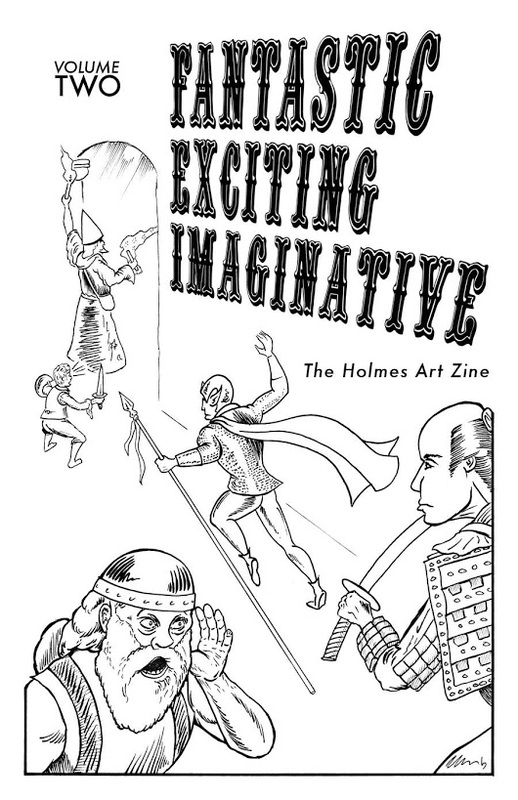 Fantastic Exciting Imaginative: The Holmes Art ’Zine is a fanzine of a different stripe. Published by Inner Ham, Fantastic Exciting Imaginative: The Holmes Art ’Zine is draws from a source for its inspiration—the original version of Basic Dungeons & Dragons designed by Doctor John Eric Holmes and published in 1977. Specifically, it draws from Doctor Holmes’ description of the game as “fantastic, exciting, and imaginative” for both its title and its content. That content is simply a medley of monsters, magic, and more, with new spells, magical items, NPCs, and creatures created by some twenty-six or so contributors, each entry drawn from a particular illustration to be found in the pages of the Holmes’ edition of Basic Dungeons & Dragons. What this means is that the fanzine really does consist of things that you can add to your game without any particular theme or flavour. This has the downside that some of the content is perfectly acceptable in terms of Dungeons & Dragons, but somewhat bland in terms of its fantasy. Thankfully some of the content rises above this blandness to present interesting content which will definitely add to your game. The more interesting entries in Fantastic Exciting Imaginative: The Holmes Art ’Zine, Volume Two, includes Elmer, the Minotaur Wizard distrusted by Humans and Minotaurs alike, who resides in his Horned Tower home surrounded by a dense maze where he researches strange magic and answers the queries of those who brave the maze. This is followed by a description of Anvil, Dwarf of the Iron Hills, an NPC to be encountered in a dungeon, hurt after a nasty fight with goblins. Heal him and hire him, and he will be a loyal hireling to an adventuring party. These are alongside a plethora of interesting magical items, whether it is The Lady’s Favour, which depending upon the colour and alignment of the wear, improves his Charisma, grants extra Hit Points, works as a Ring of Protection +1 or Ring of Invisibility, as an Elven Cloak or Elven Boots, or cast spells that protect from or detect good and evil. Chameleon Skin Chianti is a wine which alters the texture and pigmentation of the imbiber’s skin and clothing to enhance his ability to remain undetected. It is not without its side effect, as it has the potential to also shift the imbiber’s Alignment. The Dragon’s Breath Shield is of wrought iron, rough and burned, with a grate in its centre through which a fire can be seen burning. This fire casts light as a torch, but can be expelled like dragon’s breath once a day. Some items are slightly kooky, like Bubbles of Death, from which the user can blow bubbles that upon contact with enemy, set them aflame. The magic spells are equally as diverse as the magical items. For example, Blue Shift shifts the caster’s vision into ultraviolet and enables him to see both in the dark and the magical emanations for magical items and artefacts, though not know what kind of magic, whilst four spells created by the Wizard, Eldicar, are also described. They include Eldicar’s Aura of Advantageous Astonishment which when cast on armour will trigger a nimbus against hostile creatures which will knock them prone and force them to lose the Initiative in the next Round. Eldicar’s Excitable Ectoplasm drops a mass of acidic mucus on a target, which adheres to and slowly burns through organic material, hardening if the target struggles. Eldicar’s Acidic Ectoplasm is a less useful spell, creating a small glob of green and metaphysical goo which can be flicked or wiped off to burn or corrode for a few Rounds. Eldicar’s Amazing Agility and Endurance allows the caster to increase a target’s Dexterity and Constitution. Oddly there are no spells for the Cleric Class in the issue. Although there are lots of monsters described in Fantastic Exciting Imaginative: The Holmes Art ’Zine, Volume Two, but fewer of them really stand out in comparison to the magic items and the spells. For example, the humanoid Mannequin are utterly neutral in terms of Alignment, design, and intent such that the Dungeon Master is left what to do with them. Better still is the Speckled Muck, a clear ball of slime dotted with detritus which has a penchant for paper, parchment, and clothing, which is followed by the Morrigan Sisters. These famed Harpies—‘The Maiden’, ‘The Mother’, and ‘The Crone’—are said be avatars or high-priestesses of the grim goddess, Morrigan, and who echo the Ladies of Sorrow. Aswith the magic items, there is a streak of whimsy to the issue with its monsters, this time being the Wild Things of children’s literature fame. 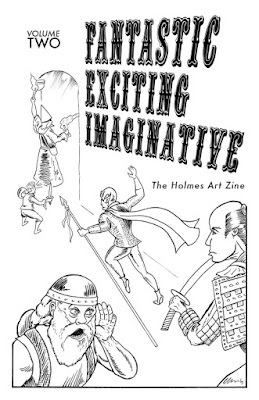 Physically, Fantastic Exciting Imaginative: The Holmes Art ’Zine, Volume Two is tidily presented. The illustrations are rough and ready, but this means that they feel in keeping with the style of Holmes’ edition of Basic Dungeons & Dragons. With over seventy entries in this volume, there is a lot for the prospective Dungeon Master to pick and choose from. Doubtless there is something in the pages of Fantastic Exciting Imaginative: The Holmes Art ’Zine, Volume Two that will find its way into said Dungeon Master’s game. Nor does it matter if that game is not Holmes’ edition of Basic Dungeons & Dragons, as the mechanical elements in this fanzine are simple for the Dungeon Master to develop just a few steps to fit the mechanics of the game he is running. Overall, Fantastic Exciting Imaginative: The Holmes Art ’Zine, Volume Two is useful in bits and places, but the Dungeon Master has the choice of which places and which bits.